A sweet, savory combination with just a pinch of heat- this bacon wrapped chicken breast is slow smoked to juicy perfection. Trim each breast of fat. Liberally salt & pepper each chicken breast. 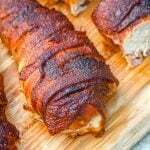 Using the strips of bacon, wrap each breast completely in bacon, tucking & weaving as necessary. In a small mixing bowl, add the brown sugar, chili powder, and cayenne pepper. Using a fork, stir everything together until evenly incorporated. Sprinkle the mixture evenly out over the bacon wrapped chicken breasts. Use your hands to press the mixture in, so that it sticks. Smoke at 275 degrees for 3- 3 1/2 hours, using your favorite chips. Replenish chips half way through the cooking. Remove the chicken immediately, and wrap the breasts in tin foil and let 'rest' for an hour before opening, and serving. If the bacon isn't crisp enough, you can set it on a pan under the broiler for a couple minutes to crisp up.